Like many Malaysian dishes, it begins with the rice. 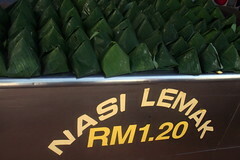 Nasi lemak, steamed rice flavored with coconut, is the foundation for this breakfast and snack favorite. 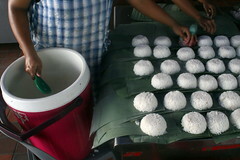 Sometimes, as at this well-known Singaporean stall, the rice is steamed with pandan (screwpine) leaves for added fragrance. 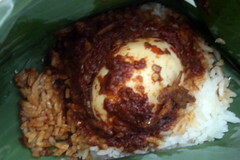 This takeaway version (rm 1.20 each) offered a short but satisfying roster of ingredients: rice, egg, anchovy, and chili sauce.